Vyasa divided the Vedas to make them easier for people to learn. It was to help mankind similarly that he composed the "astadasa Puranas" (the eighteen Puranas). I regard Vyasa as the first journalist, the ideal for all newspapermen of today. He composed the Puranas and made a gift of that great treasure to humanity. How have they (the Puranas) benefited us? They encompass stories, history, geography, philosphy, dharma, the arts. Vyasa's narration holds the interest not only of intellectuals but of ordinary people, even the unlettered. Is this not the aim of journalists, holding the interest of the general reader? However, most of them stop with this, exciting the interest of people or pandering to their taste. But Vyasa had a loftier purpose: he made the Puranas engrossing with the Purpose of taking the reader(or listener) to the goal of dharma and the Supreme Being. If holding the interest of people somehow is their sole objective, the papers are likely to propagate subjects or views that are contrary to the ideals of dharma. If journalists keep Vyasa as their forerunner and ideal, their writing will assume a noble character and contribute to the good of the world. Vyasa composed the Puranas in 400, 000 "granthas". A grantha is a stanza consisting of 32 syllables. Of these the Skanda Purana alone accounts for 100, 000. It is perhaps the world's biggest literary work. The remaining 17 Puranas add up to 300, 000 granthas. Apart from them Vyasa composed the Mahabharata, also nearly 100, 000 granthas. Each Purana is devoted to a particular deity. There are Saiva, Vaisnava and Sakta Puranas. The 18 Puranas : Brahma Purana (Brahma), Padma Purana (Padma), Narada Purana (Naradiya), Markandeya Purana, Visnu Purana (Vaisnava), Siva Purana(Saiva), Bhagvata Purana, Agni Purana (Agneya), Bhavisya Purana, Brahma-Vaivarta Purana, Linga Purana, Varaha Purana (Varaha), Skanda Mahapurana, Vamana Purana, Kurma Purana (Kaurma), Matsya Purana (Matsya), Garuda Purana (Garuda) and Brahmanda Purana. Our Acarya in his commentry on the "Visnu-Sahasranama" cites many passages from the Visnu Purana. This Purana, composed by Vyasa's father Parasara, is an important source of Ramanuja's Visistadavita (qualified non-dualism). One of the precursors of qualified non-dualism was Alavandar. Ramanuja wanted to meet him but as he arrived at his place he saw him lying dead. Alavandar had wanted to entrust Ramanuja with three important tasks. When he passed away three fingers of his right hand were seen bent in. Ramanuja understood the meaning of this phenomenon, that he had three tasks to perform. When he spoke out what they were, the three fingers unbent. One of the three tasks was to write a commentry on Brahmasutra from the standpoint of qualified non-dualism. 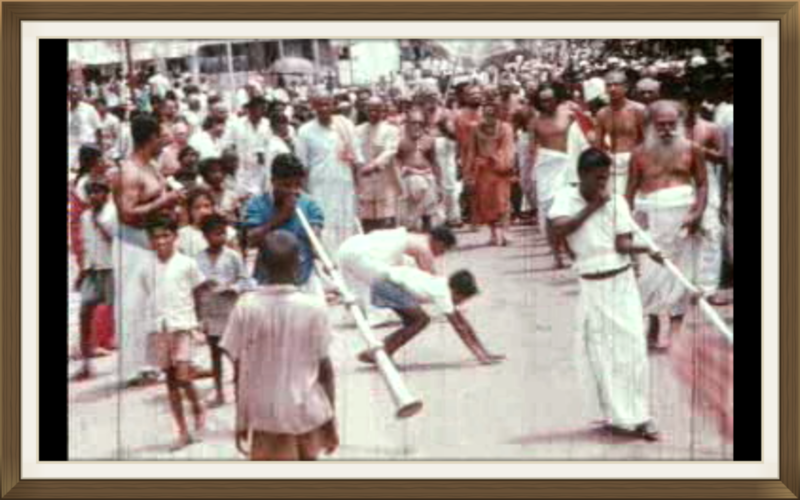 The second was to do a commentry on the Tiruvaymozhi and the third to perpetuate the memory of Parasara and Vyasa. As the author of the Visnu Purana, Parasara occupied a high position. It was with this in mind that Ramanuja named the two sons of his chief disciple, Kurattazhvar, Parasarabhatta and Vedavyasabhatta. The first grew up to be an important teacher of Vaisnavism. Though Parasara was the original author of the Visnu Purana it was Vyasa who wrote it in the present form. The sage who had divided the Vedas now composed the Puranas so that the truths embedded in the Vedas would make a deep impression on the minds of the common people. There was also another reason. Not all people have the right to learn the Vedas. It is believed that Vyasa composed the Puranas to enlighten such people (as have no access to the Vedas) on the scriptural truths. If Vyasa's father was the author of the original Visnu Purana, his son Sukracaraya it was who instructed King Pariksit in the Bhagavata. There is a difference of opinion about the Bhagavata, whether the term should refer to Visnu-Bhagavata or Devi-Bhagavata. The former is devoted to the incarnations of Visnu, particularly Krsna, while the latter deals with the divine sport of Amba. We need both and both are great works. In the systems propagated by Caitanya, Nimbarka and Vallabhacarya, the Visnu-Bhagavata has a place no less important than that of the Vedas. At the same time, non-dualists who are opposed to their ideas also treat this Bhagavata with the utmost respect. Though there is a seperate Siva Purana, three-fourths of the Skanda Purana is devoted to Siva. It also includes the story Skanda or Muruga. Kacciyappa Sivacariyar of Kancipuram has written a Kanda Puranam in Tamil: it is devoted [as the name itself suggests] mainly to Subramanya or Skanda. "Durga-Saptasati" is a part of the markandeya Purana. "Candi-homa", in which oblations are made to the goddess Candi, is performed with the recitation of the 700 stanzas of this hymnal work: each stanza is regarded as a mantra. "Bhavisya" means the future. The Bhavisya Purana contains many matters including the evil doings of the age of Kali. In the Puranas, apart from the story of the Mauryas and others rulers, there is also a reference to the advent of the white man. Critics discount such accounts believing that they could not have written by Vyasa at the begining of the Kali yuga. "Somebody must have written them recently. " they argue, " and put the name of Vyasa to them. " Admittedly, there must be interpolations here and there in the Puranas but it is not correct to say that the Puranas were all recently written. Men with yogic power can see past, present and future. Sitting in one spot they can see happenings all over the world. It is not easy for people to write works like the Puranas and ascribe their authorship to the great men of an earlier era. The Garuda Purana deals with the world of the fathers and related matters. It is customory to read it during the sraddha ceremony. "Lalitopakhyana", the story of Lalitambika, occurs in the Brahmanda Purana, so also the "Lalita-Sahasranama" (The one thousand Names of Lalita). The reading of the 18 Puranas is to be concluded with this Purana which contains a description of the coronation of Rajarajesvari. Devotees of the goddess take special pride in this fact. The Puranas contain many hymns, hymns that include the one hundred and eight or the one thousand names of various deities. But the "Visnu Sahasranama" (The one thousand names of Visnu) and the "Siva-Sahasranama" (The one Thousand Names of Siva) are part of the Mahabharata. The "Pradosa-stotra" is in the Skanda Purana.